Protects from free radical oxidation. 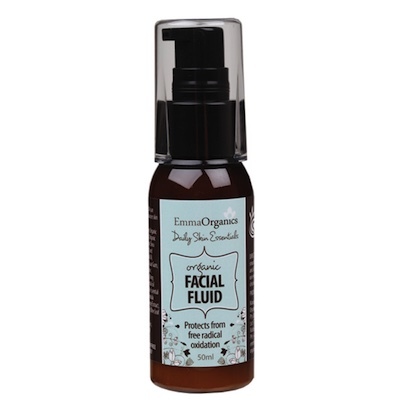 Emma Organics Essential FACIAL FLUID is an easily absorbed day fluid, which rebalances skin sensitivity and dryness. ACO Certified. Free from parabens, sulphates, colours, synthetic fragrances, phthalates and formaldehyde causing agents. INGREDIENTS: Purified Water (Aqua), Organic Aloe Vera (Aloe barbadensis) Juice, Organic Safflower (Carthamus tinctorius) Oil, Organic Cocoa (Theodrama cacao) Butter, Organic Macadamia (Macadamia ternifolia) Oil, Organic Shea (Butyrospermum parkii) Butter, Organic Coconut (Cocos nucifera) Oil, Organic Glycerine, Glyceryl Caprylate, Cetearyl Olivate, Sorbitan Olivate, Xanthan Gum, Parfum (Natural Preservative), Organic Rosehip (Rosa canina) Oil, Organic Avocado (Pesea gratissima) Oil, Organic Coconut (Cocos nucifera) Water, Pink Grapefruit (Citrus paradisi) Essential Oil, Organic Ylang Ylang (Cananga odorata) Essential Oil, Carrot (Daucus carota sativa) Oil, Tomato Seed (Solanum lycopersicum) Oil, Natural Vitamin E (Tocopherol), Organic Olive Leaf (Olea europaea) Extract, Organic Calendula (Calendula officinalis) Extract, Organic Rosemary (Rosmarinus officinalis) Extract, Sandalwood (Santalum album) Essential Oil, Organic Chamomile (Chamomillia recutita) Essential Oil.